Handy Mobile—the museums I liked. 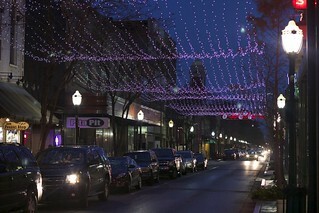 Dauphin Street, Mobile’s Downtown Street. Last summer, The Traveling PhD, her husband, and I were debating where we would meet for New Year’s Eve – Given the constraint set, essentially our debate was between New Orleans and Mobile. Before this trip, my experience with Mobile was about 15 minutes during spring break 2000, plus reading about wartime Mobile in Red Sky at Morning, one of my favorite novels. Thus I had pretty low expectations for Mobile – expectations driven by the stereotypes of it being a “large” city in a red-state. I’d generated a list of potential activities, but not really sure what the city would look like. Mobile has handily beaten any expectations I had and has done so by a margin that I could not have predicted. Now I’m not ready to move to Mobile, but I can say that Mobile is a pretty darned good vacation spot and spot to celebrate New Year’s Eve. For those of you who are curious, here are the museums I visited, call it a Handy Mobile, the museums I liked – I visited the museums with my New Orleans Friend. Police Museum: The Mobile Police have their own museum on Dauphin Street – and it had the best price/value ratio of any museum we visited on this trip. It was free – and worth 15 or 20 minutes of exploration. Mobile Museum of Art: This museum was surprisingly good – although some of the art was a bit disturbing. Among the more permanent exhibitions there were some oddly juxtaposed pieces. The highlight was a nice exhibition of photographs of Mobile, “Why We Are Here”. The Haverty Collection of International Studio Glass, was also diverting. We spent a lot more time at the museum than we expected. Mobile Carnival Museum: Do not miss this museum – Mobile was the first city (at least in the US) to celebrate Mardi Gras. 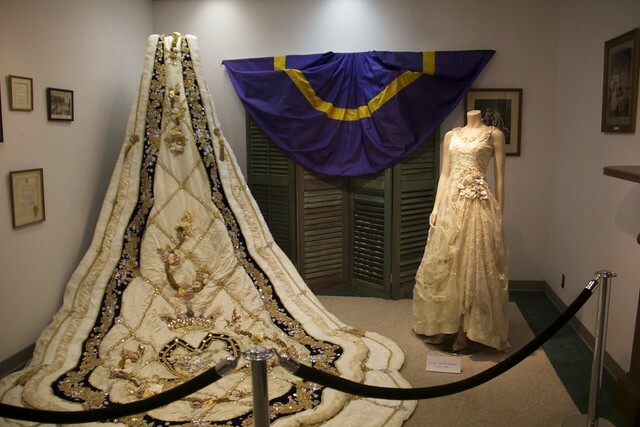 The Museum covers the history of Mardi Gras in New Orleans and has on display the dresses that Mardi Gras Kings and Queens have worn over time. Most impressive are the trains that go behind both the Kings and Queens. Imagine pulling that train while walking — and Kings have equally impressive trains. Fort Gaines: Out on Dauphin Island, this fort was involved in the Battle of Mobile Bay during the Civil War. It’s a nice place to visit, with a great view of the Gulf of Mexico and, unfortunately, great view of natural gas drilling rigs. This 10 seater was flushed by tides. 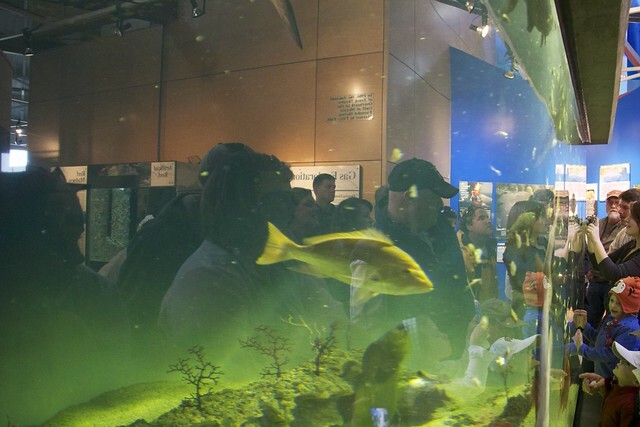 Dauphin Island Estuarium: Basically this is a sad, pathetic, aquarium that attempts to explain the biodiversity of the Mobile Bay. The only redeeming feature of our visit was that we visited during one of the three weekly feedings so we got to see the fishes eating their lunch. The most exciting moment at the Estuarium. USS Alabama Battleship: The battleship named after the State of Alabama retired to Mobile, where it now entertains tourists with a dose of patriotism. I didn’t do the whole tour, but did everything below the decks. There are an awful lot of tight quarters and it didn’t look all that comfortable. As a professional landlubber, I found it educational. Unfortunately, due to holiday hours, I didn’t make it to all the museums on my must-do list, missing the Museum of Mobile. Perhaps next time.